The car arrived fully charged with the onboard indicator showing an optimistic 73 mile range. With temperatures forecast to reach 93 degrees, I’m going to need that air conditioning. Turning on the A/C drops the range counter to 64 miles without even leaving the driveway. My daily commute is 42 miles round-trip so there should be no issue, but there are no charging stations on my route should I need to top up. I won’t be charging until I’m home again. The i-MiEv passes the test. I arrived at work with 41 miles of range and returned home with 23 miles left over. I awoke to a problem. The car didn’t have time to fully recharge overnight. The i-MiEv arrives with an 8A/12A Level 1 charging cable. My garage is only capable of using the 8amp, 110V charging system. In EV speak, that’s Level 1 and translates to a 22 hour charge time. Had my garage had a 12amp, 220V circuit, the charge time would drop to 14 hours. Exchanging a once-a-week, 5 minute stop to pump those horrible hydrocarbons into my car with a nightly, 14-hour charge doesn’t exactly come across as “more convenient”. Yesterday’s late return and the i-MiEv’s 22 hour charge time meant I didn’t have enough range to go round-trip to work the next day. If the premise was to use the i-MiEv as a daily driver, it failed halfway through the test. Back to internal combustion for a day. With a full charge and full Saturday morning to-do list, the i-MiEv is finally in its element. Around town, the instant torque from the electric motor makes it perfect to jump into traffic. There’s no long trip to induce anxiety. With regenerative braking in its most aggressive mode, you learn to drive with a single pedal. 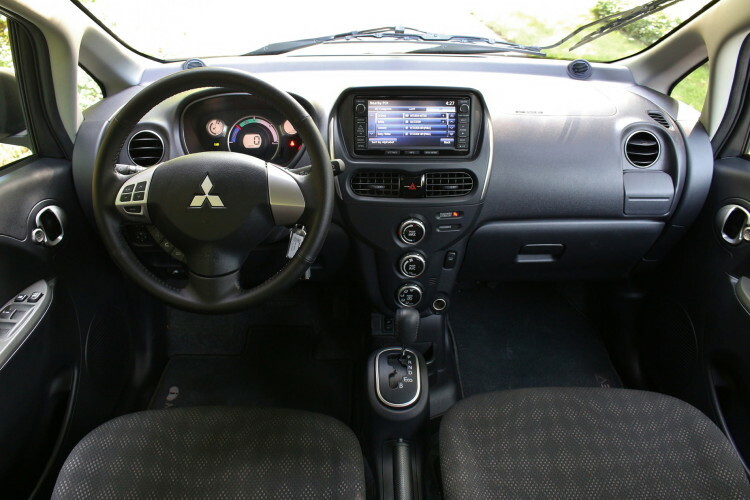 It’s the most efficient method and acts as some level of mental escape from the i-MiEv’s interior. For the most affordable EV to stay inexpensive, it gets minimal luxury treatment. Hollow plastics and hard, manual seats show the true price of frugality. The owner’s manual rationalizes the standard heated seats as more efficient than the HVAC system as a means of warming up on cold mornings. We wouldn’t know that if the switches had been mounted somewhere rational. Sometimes the hardest thing about a car is finding a location to photograph it. Not so with the i-MiEv. This is a city car being used well outside its comfort zone…in a county where someone’s other car could legitimately be a tractor. We want to show it as such, so it was off to a corn field. The soft hum of the electric motor and the crunch of gravel under the narrow tires are the only noises present as the i-MiEv crawls down the dirt access road. This must be what David Scott experienced as the first man to drive on the moon. Sort of. The last day with the i-MiEv was much like the first; 64 miles to start, plenty of air conditioning, and 24 miles when it was said and done. What had left, after a week to get acquainted with the most affordable EV on the market, was the trepidation.